Alex Sinclair has worked in the comic book industry as a colorist for 25 years. He has spent most of his career coloring for DC Comics and their many iconic characters. Sinclair worked on many series including Batman, Superman: Unchained, Green Lantern, Justice League, Harley Quinn, and Wonder Woman. 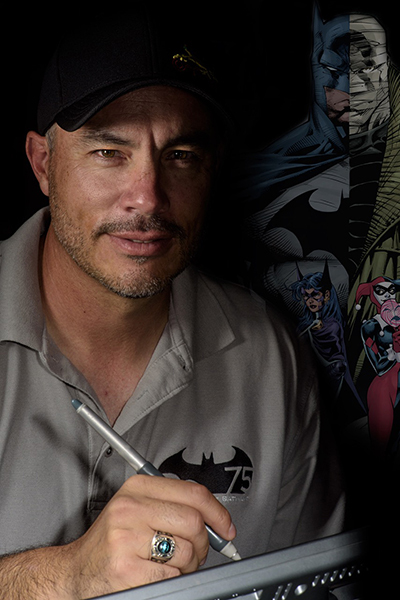 His collaborations with Jim Lee and Scott Williams on Batman Hush, as well as Ivan Reis and Joe Prado on Blackest Night earned him global recognition and multiple awards. His current projects include Harley Quinn, Superman, and Frank Miller’s prequel to 300, Xerxes. Sinclair was born in Mexico where he lived until he turned 16. His family then moved to San Diego where he continues to live. He attended the University of California San Diego where he got his Bachelor’s Degree in Studio Art from UCSD’s Warren College in 1991. All along, Sinclair’s love for comics was reflected in his artwork. After graduating, he built a portfolio and showed it to various comic book artists and editors with aspirations of becoming a professional in that industry. His career path took a turn for the better when he answered a Talent Search from a new and well revered comic Studio. The studio’s owner, Jim Lee, hired Alex as the first digital colorist for his company, WildStorm. There, Sinclair helped establish and head the studio’s acclaimed coloring department. When DC Comics acquired WildStorm in 1998, Alex worked as an art director and editor. He continued coloring on a freelance basis the entire time. In 2006 Sinclair left DC Comics to work strictly as a freelancer and focus on his color work. More importantly, he was able to spend time with his wife Rebecca and daughters Grace, Blythe, Meredith, and Harley. Sinclair also enjoys teaching art classes at the world renowned San Diego Zoo, thus enabling him to pursue his other passion, drawing and painting wildlife art.